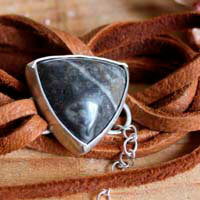 The fossil agate is part of the quartz family and shows black/gray colors with some brown and white spots. It also has some fossil shell inclusions imprisoned in the silica. Its name comes from the shell and snail family, from the name turitella. However, there is a difference made by some experts. They say it cannot be part of this family because this agate appeared in old dried lakes whereas the turitella is an animal from the ocean. At the present time, this freshwater fossil snail has not really been identified for sure. It symbolizes richness. It is then common to see it in one’s purse or in the cashier to attract money. 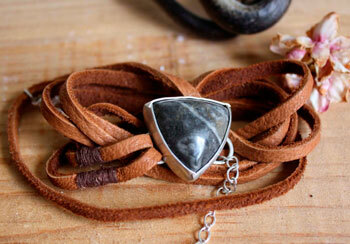 The fossil agate symbolizes richness and prosperity. It would help to cure damaged organs and would relieve pains in the back, cramps and headaches. It would be useful for stomach and digestion problems by helping to better assimilate food. It would particularly help the absorption of vitamin A, zinc, calcium and magnesium. 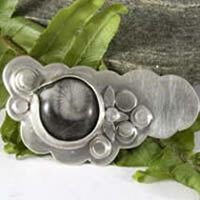 The fossil agate would help to establish the link between the pregnant woman and his future baby. It would increase the chances to get pregnant. turitella agate would relieve swollen hands and feet. It has the same properties than agates in general.